By Azzief Khaliq in Internet. Updated on April 16, 2019 . If you spend a lot of time in Gmail, composing and replying to emails, you’ve probably started wishing that there were certain things you could change in order to improve your Gmail experience. Maybe you miss the old compose window, or maybe you wish that you didn’t have to look at all those ads, or perhaps you’d like the option of tweaking the interface here and there to suit your needs and tastes. Well, you can stop wishing, because Gmelius is here. Gmelius is a browser extension that aims to provide a cleaner and smarter Gmail experience. It lets you customize the Gmail interface, showing only the elements you need and hiding the rest. 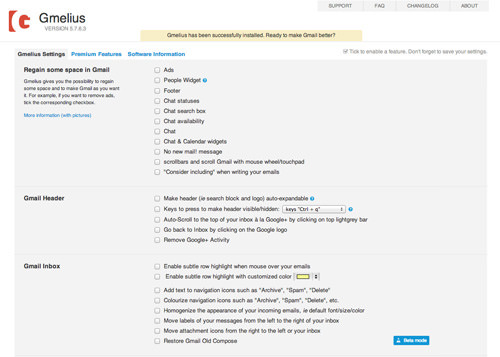 Whether you want to reduce clutter or just want to freshen Gmail up, Gmelius is the extension for you. Gmelius is available for Google Chrome. Note that you can also download the extension from the official website, which should detect the browser you’re using and offer the correct version for download. Either way, once you’ve installed Gmelius, you should instantly be taken to its configuration screen. No extra logins or anything of the sort to worry about. As you can see from the configuration screen, Gmelius has a lot of features, grouped into separate categories, that will help you get your Gmail interface just right. We don’t have the space to discuss every single feature in depth, so here’s a quick run-through of the more notable features. All of the options in the Regain some space in Gmail category have to do with removing certain elements of the Gmail interface, freeing up screen real estate for the important things, namely the emails themselves. Amongst the interface elements you can disable include Ads, the People Widget, the footer, all the chat-related elements and the scrollbar. 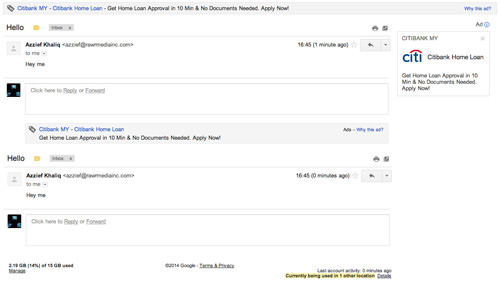 There are also options that can tweak how the Gmail Header works. You can enable things such as an additional button to hide and show the Gmail header bar, the ability to automatically scroll to the top of your inbox by clicking the topmost light grey bar, as well as hide Google+ Activity. The Gmail inbox category houses all the features that change the inbox itself. You can enable a subtle row highlight when you mouse over emails, homogenize all incoming emails, add text to and colorize navigation icons as well as restore the old Gmail compose window. Do bear in mind that the old compose window is still in beta, so you may encounter some small bugs here and there. Finally, Gmelius also has the ability to add attachment icons to your inbox. By default, the Gmail inbox only shows that there’s an attachment with that small paperclip icon, without showing what sort of attachment it is. Enabling this feature changes this paperclip icon to an icon that matches the type of file that’s attached to the email. More than 40 filetypes are currently supported. Gmelius also includes a few premium features. These features are free to use while the extension is in beta, but expect to have to pay for them once the extension leaves beta. There are currently two options in the Make Gmail Smarter category. Firstly, you can enable the ability to search Gmail directly from the omnibox or address bar, which is a very handy feature that most will probably find useful. There’s also a feature that that automatically simplifies email addresses, replacing "[at]" and "[dot]" with the more readable "@" and ". ", that’s enabled by default. There’s also a Print cleaner emails option. This option removes the Gmail logo and modifies Gmail’s printing stylesheet to make your printed emails look more professional. The modified stylesheet also lets you include more text in a single page, quite handy for those really long emails. This feature is also enabled by default. As you can see, Gmelius is a great solution for anyone who’s not entirely thrilled with the Gmail interface and wants to change things up a bit. Between hiding unused interface elements to tweaking the colors and behavior of the Gmail inbox, Gmelius has probably got you covered. Gmelius is currently free, with no charge for the Premium features yet, but you can donate to the developer if you like the extension.